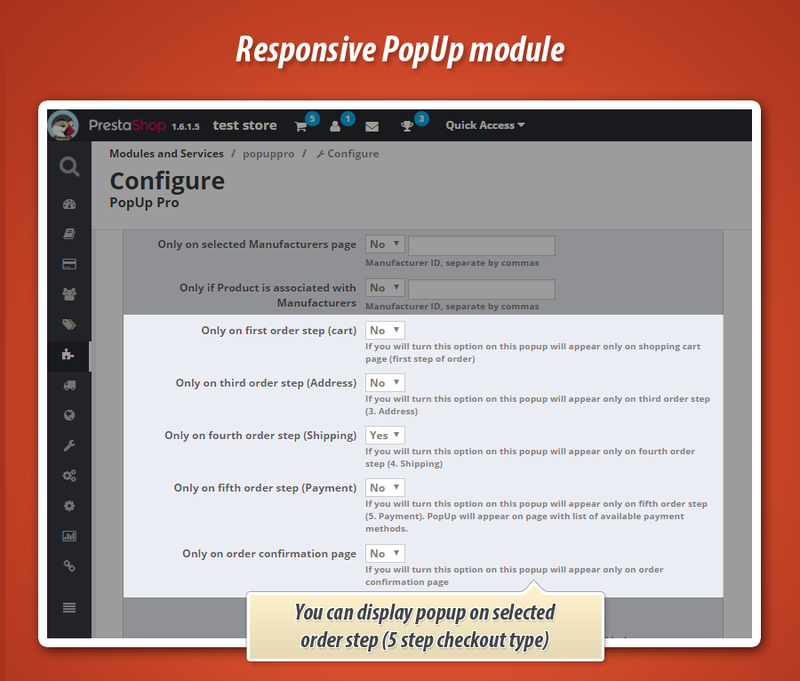 This module creates a special popup block with any content you want. 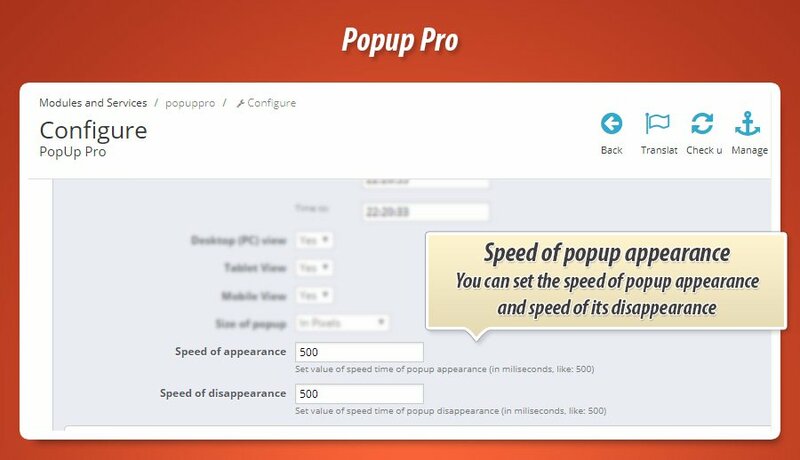 This mean, that you can create popup box with many images, urls, texts, buttons etc. 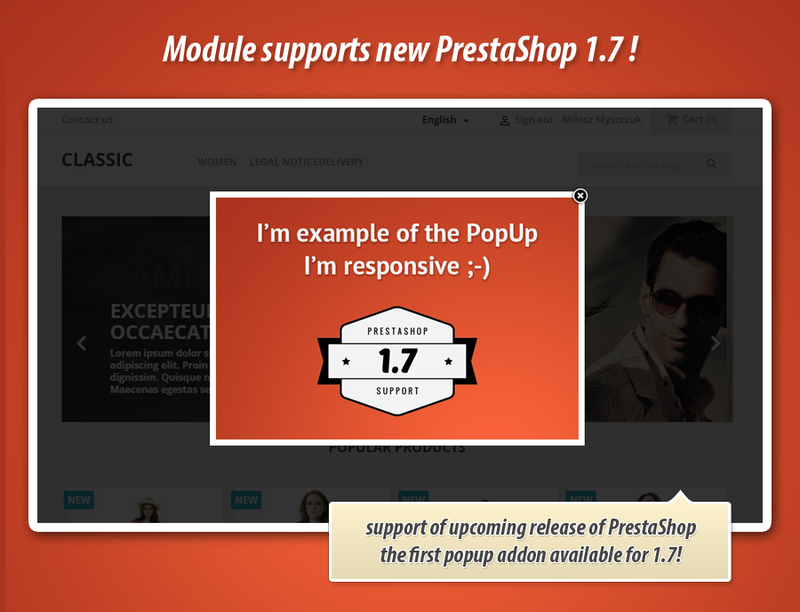 With this addon you've got an ability to change design of the popup. With customization tool you can easily change module settings. Read more below. 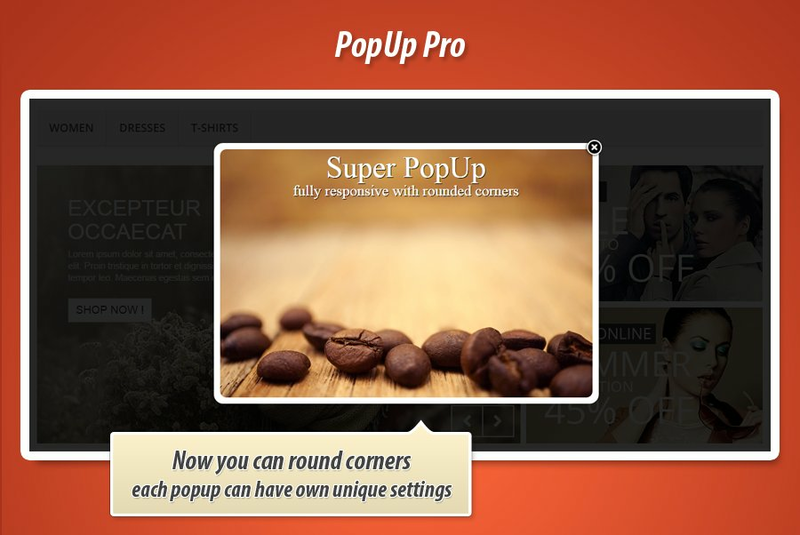 As we say, Popup pro is a prestashop module which gives you an ability to create nice popup box with any content you want, this mean that you can create special popup box with many images, texts, buttons etc. 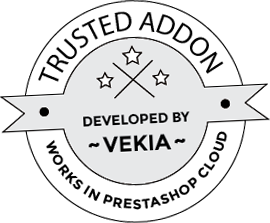 The main advantage of the module is fact that you can create own design by special customization tool. 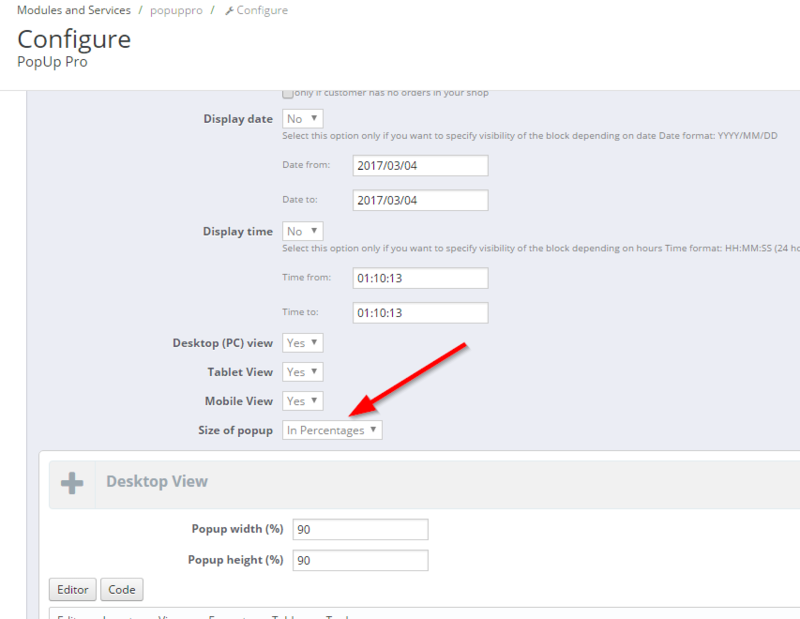 You can turn module on specified page, like homepage and turn it off on other pages. 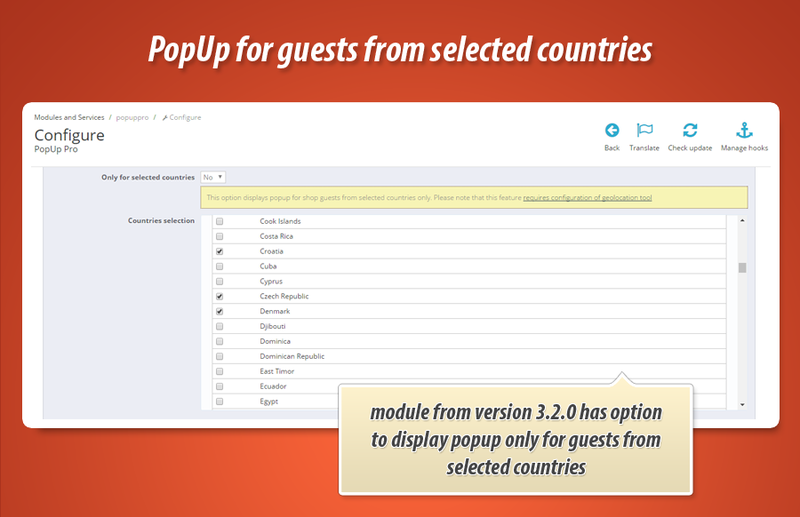 Module allows to create unlimited number of popups, it means that you can create any amout of popup windows you want. In addition easy in use tinymce editor allows to easily manage blocks. You can manage order of popups. 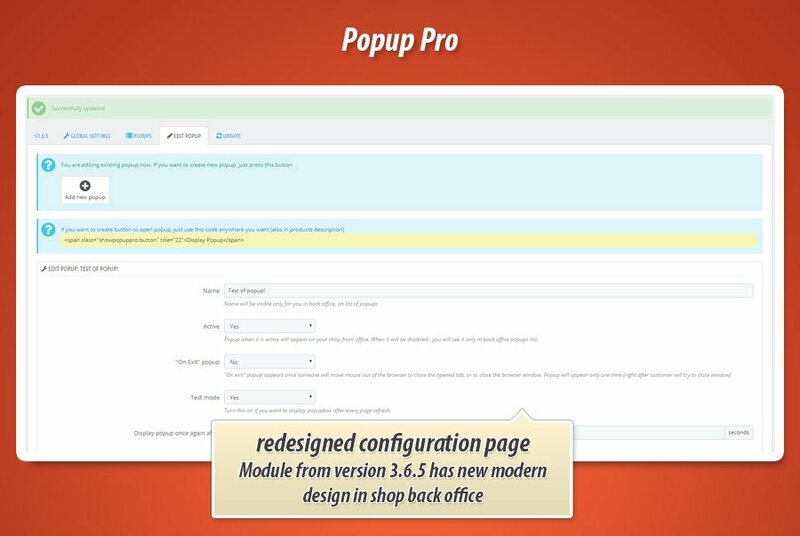 It means that popups will appear in order you will define in back office. This featyre allows to easily hide some unwantend popup blocks. 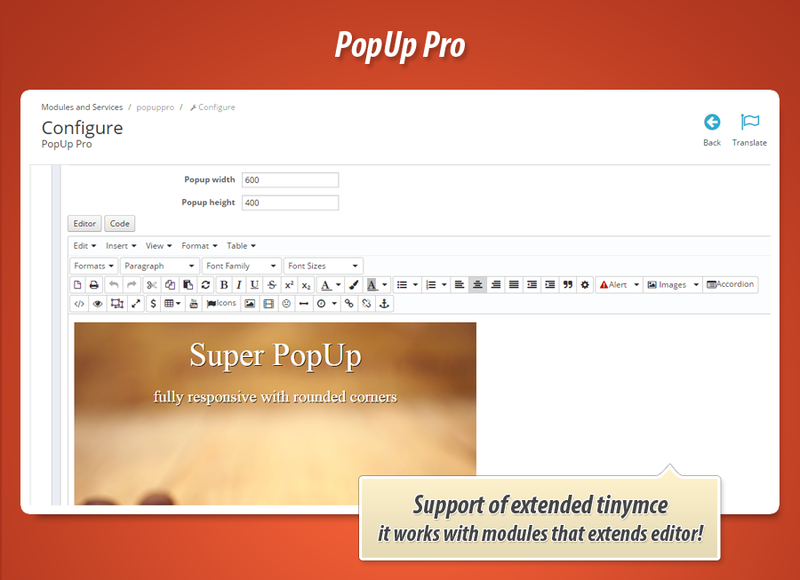 Module allows to define layout of the popup window. 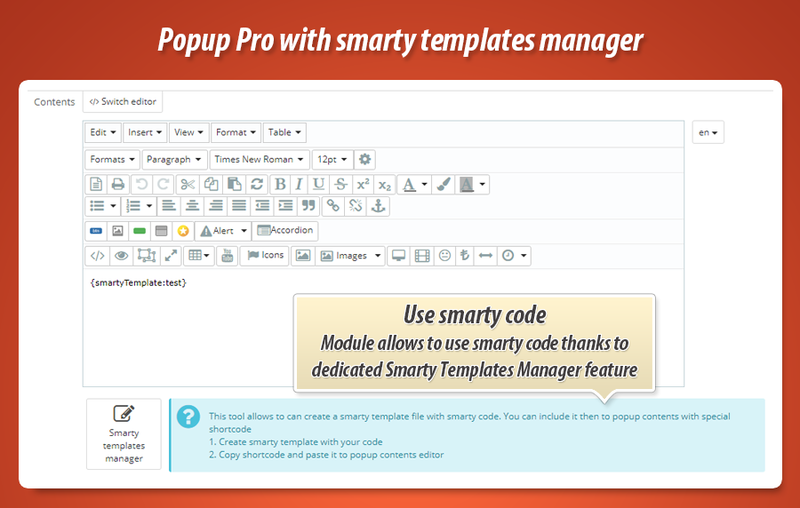 You can specify background, borders, size of the popup, overlay opacity, background etc.! 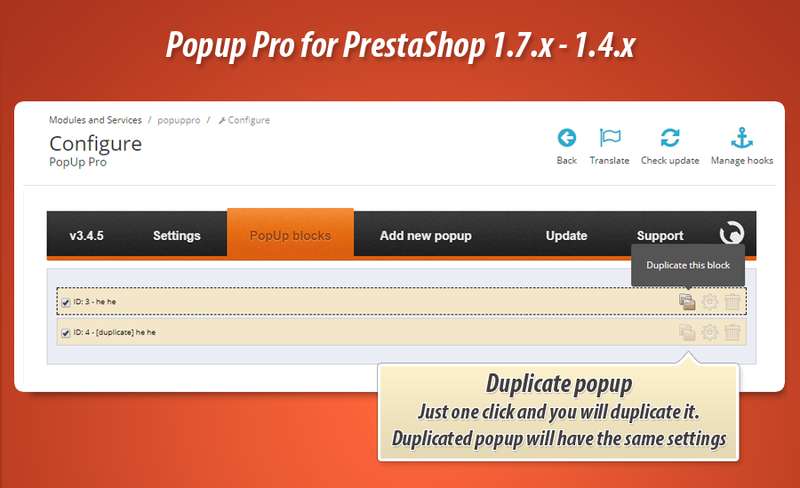 The main feature of this addon is an ability to create special popup box with any content you want. 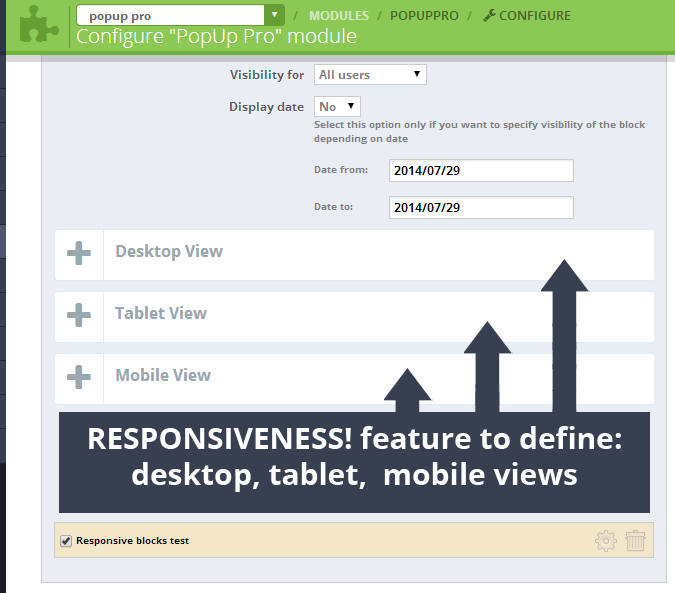 You can also design popup parameteres, pages where the popup will appear etc. You can create buttons to other pages like specials, cms pages, product pages etc. 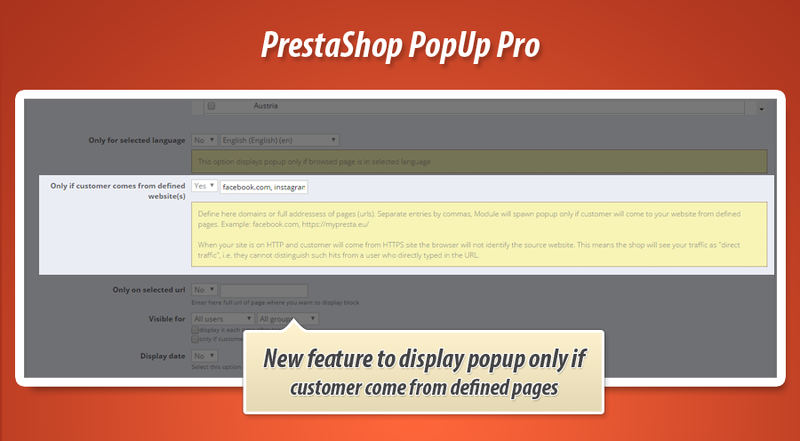 This module contains feature to define how popup window will appear and how it will disappear. You can select Slide in / Fade in and Slide out / Fade out animation effects. 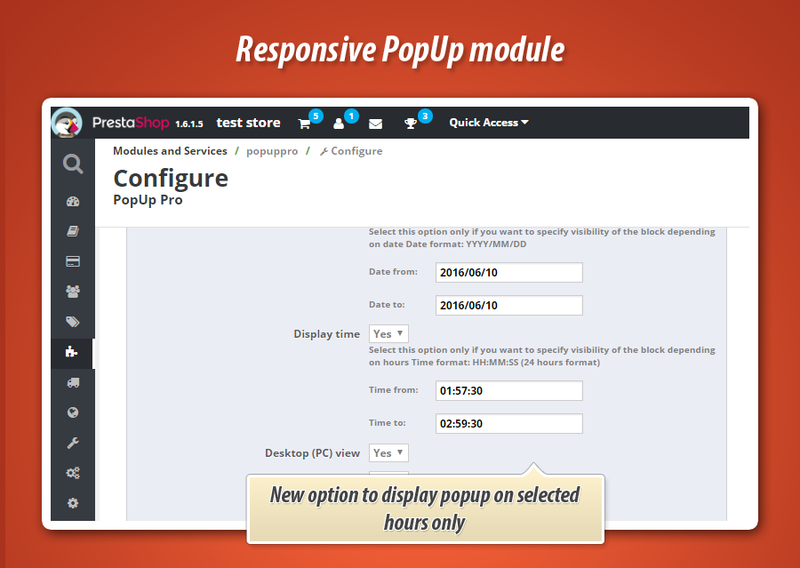 - added feature to display popup on selected weekday like monday, saturday, sundat etc. - added better support of caching modules like pagecache, expresscache, jcache etc. 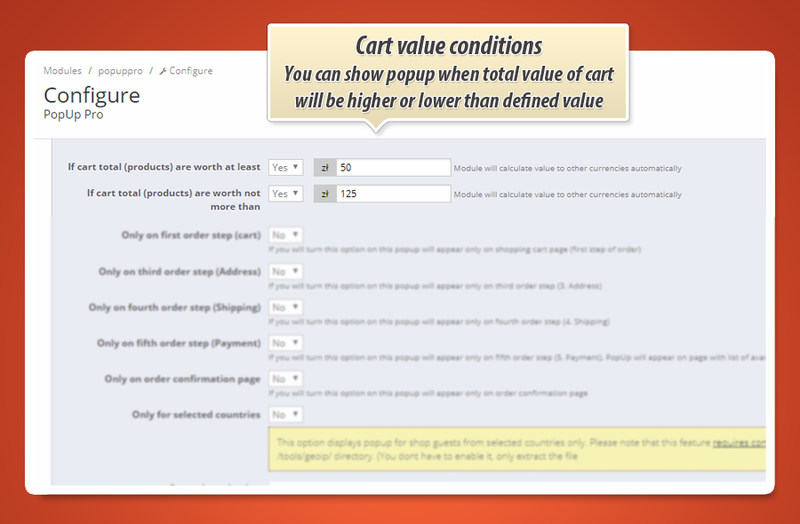 - added fixes to features to show popup during checkout (order steps) with enabled geolocation option. These features work together properly now. - added improvements to save process of "global settings"
- So, with new feature you can define domains or full addressess of pages (urls). Separate entries by commas, Module will spawn popup only if customer will come to your website from defined pages. - When your site is on HTTP and customer will come from HTTPS site the browser will not identify the source website. This means the shop will see your traffic as "direct traffic", i.e. they cannot distinguish such hits from a user who directly typed in the URL. When your site is on HTTP and customer will come from HTTPS site the browser will not identify the source website. This means the shop will see your traffic as "direct traffic", i.e. they cannot distinguish such hits from a user who directly typed in the URL. - added fixes to recently added feature (identify the country of customer). 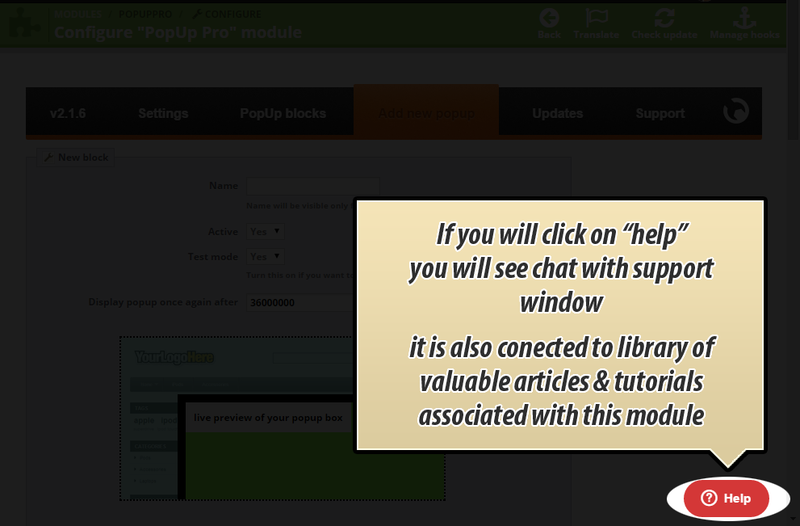 Now it properly displays popup. - this feature works with "test" mode the same as with other module features like spawn popup with button click etc. added fixes and improvements to "on exit" feature with option to "close" popup only with pressing "close button"